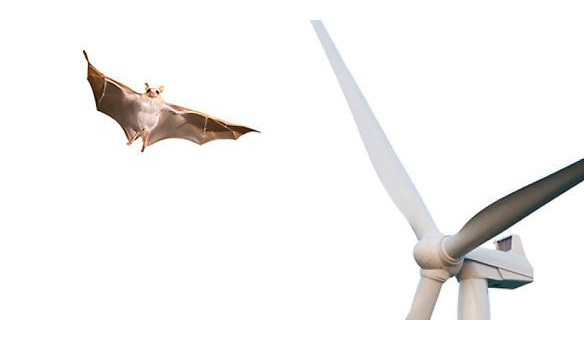 Why do not bats see wind turbines? The figure is scary: wind turbines in France (6,000 today) could have caused the death of 1.6 million bats over the period 2002-15, according to the Environment Agency and the control of energy (Ademe). If the authors of the study establish a cautious range between ... deaths between 12 000 and 3.3 million animals, the excess mortality of this already declining species is recognized. Bats , which hunt at dusk and at night, are not blind. So what ? Some criminalize the signal lights placed on wind turbines to prevent aircraft from their presence, which attract insects and therefore pipistrelles and other common bats, then swept by the blades. But it seems in fact that it is especially the strong variation of pressure caused by the passage of the blades in front of the mast of the wind turbine which creates a "barotrauma". "The fragile capillaries of their lungs burst during this brutal depression," says the Bird Protection League. The sonar of the bats works by echolocation and detects very well the obstacles, but it remains blind to the pressure drops.